I’ve been eating a lot of quinoa recently. In the summer, the superfood grain replaced rice in this rendition of a Chipotle Burrito Bowl I frequently made for work lunches. During the fall, I subbed quinoa for pasta in Giada’s Roasted Butternut Squash dish for a boost of protein. However, while quinoa is delicious in both recipes, I’ve never found myself thinking, “Who needs rice or pasta? !” But in this recipe, the quinoa really does shine. The grain acts like a sponge, soaking up the delicious chili/garlic/soy/peanut sauce. You know how much I love peanut butter. There were two main tweaks I made to Iowa Girl Eats’ fantastic recipe. 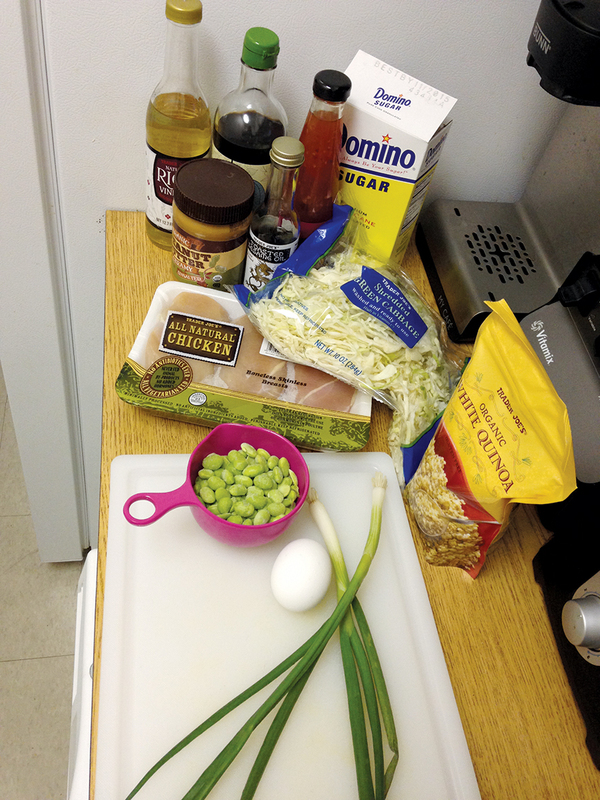 The first was the quinoa preparation. 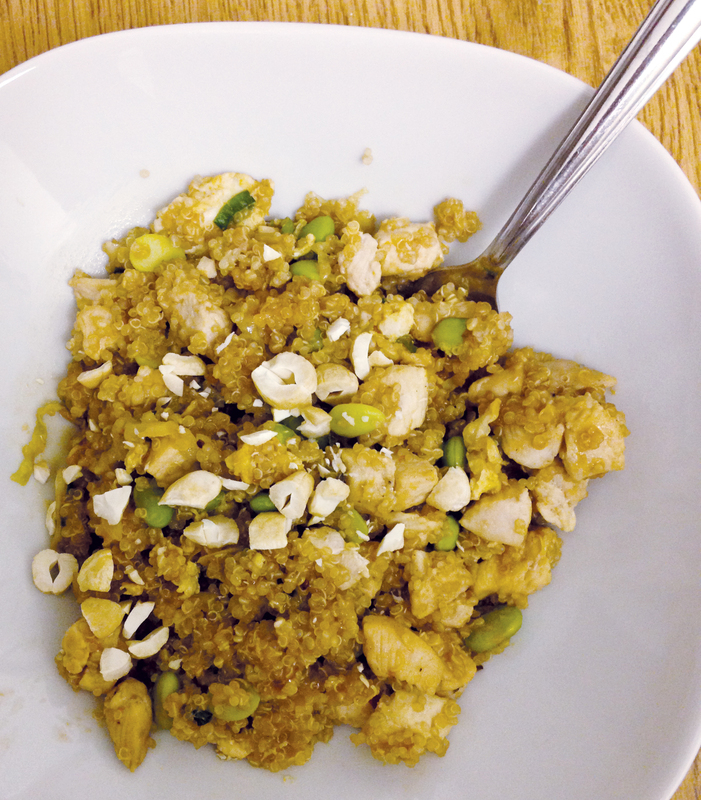 I followed the wisdom of Cook’s Illustrated and began by toasting the quinoa to bring out its natural nutty flavor. Secondly, I increased the amount of chicken (because four servings with only 6 oz of chicken was depressing) and chopped it into small pieces. This decreased its cooking time while increasing the bites-to-chicken ratio. My dear friend, Lulu, introduced me to the art of minced chicken when we made her family’s Kung Pao Chicken recipe during our freshman year of college. From then, I was hooked. While there are a number of Asian ingredients in this dish, they’re all easy to find, especially if you are near a Trader Joe’s. Also, leftovers make a delicious lunch the next day (cold or hot!). 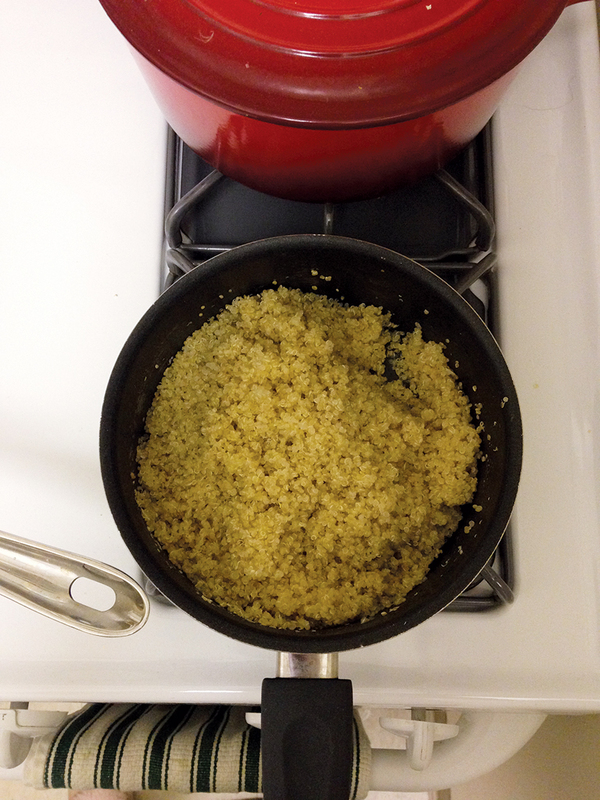 If you buy unwashed quinoa, rinse the grains in a fine-mesh strainer, drain them, and then spread them on a rimmed baking sheet lined with a dish towel and let them dry for 15 minutes before proceeding with the recipe. 1. Toast quinoa in medium saucepan over medium-high heat, stirring frequently, until quinoa is very fragrant and makes continuous popping sound, 5 to 7 minutes. Add 2 cups of water to the saucepan. Cover, reduce heat to low, and simmer until grains are just tender and liquid is absorbed, 18 to 20 minutes, stirring once. Set aside. 2. Combine all sauce ingredients in a microwave-safe bowl then microwave for 20 seconds. Stir until smooth then set aside. Whisk together egg and sesame oil in a small bowl then set aside. 3. Heat 1 teaspoon coconut oil in a wok or large skillet over high heat. Season chicken with salt and pepper then add to wok and stir fry until no longer pink. Remove to a plate then set aside. 4. 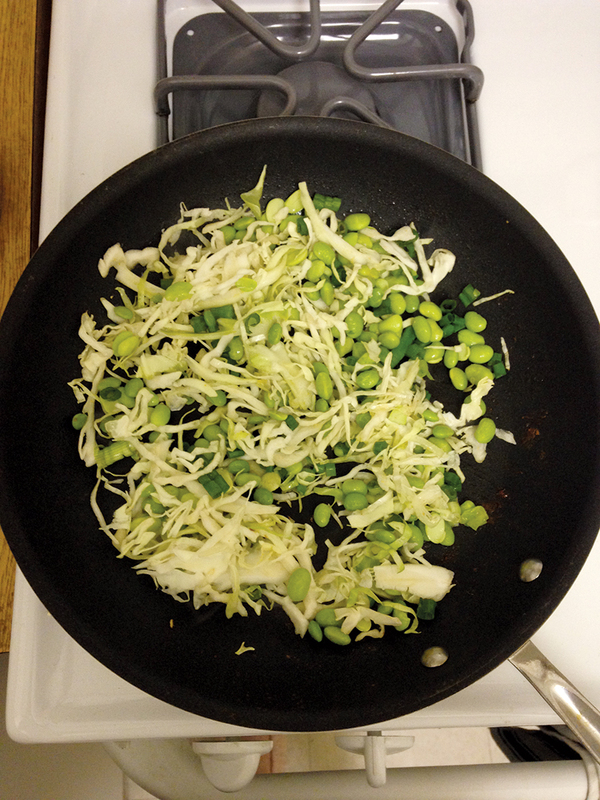 Heat remaining teaspoon coconut oil in skillet then add shredded cabbage, frozen edamame, and green onions. Stir fry until tender, 2-3 minutes, then push to outsides of skillet, creating a clear space in the center. Add egg whisked with sesame oil to center and stir fry until softly scrambled. 5. 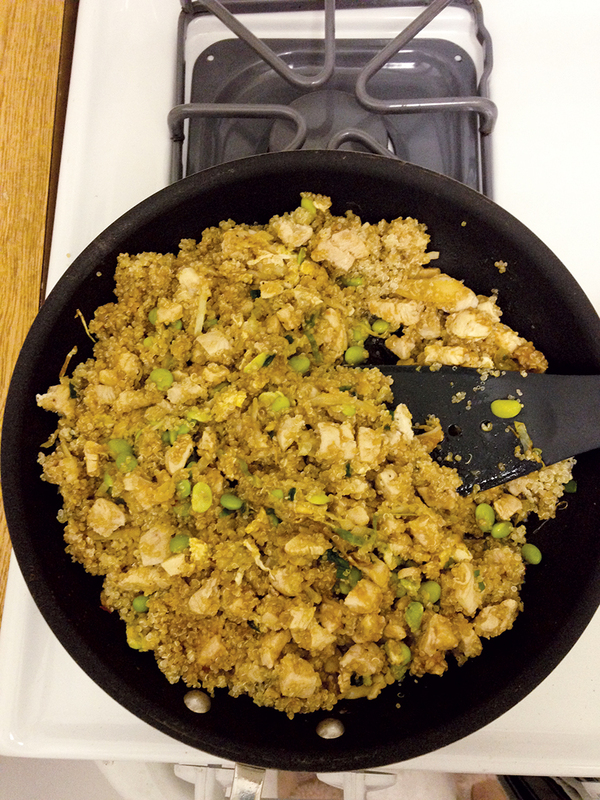 Add reserved cooked chicken, quinoa, and sauce to the skillet. Stir and serve. Two questions/comments – can I use Heinz chili sauce, if that’s all I have? and, do I mince the chicken before I cook it?? Made this for lunch today, absolutely delicious!